This is the last Perfect Picture Book Friday before it takes a break for the summer (though I may still share wonderful finds I come across this summer). They are also celebrating their 100th PPBF (on the 101st post). So how could I NOT share one? First Page: Back when the old, old West was still as green as a bristlecone pine and cowboys were as common as warts on a Stegasaurus, one cowboy stood out among all cowboys. He was as strong as an Iguanadon and as fast as a Utah Raptor, and his name was Rocky. Now, Rocky weren't a big feller, but his size didn't matter. Synopsis (from Amazon): With the strength of an Iguanodon and the speed of a Utah Raptor, lasso-tossing, Pleiosaurus-riding Rocky is legendary. There isn't a dinosaur in the land that would think of giving Rocky a lick of trouble. That is, until he meets T. Rex, the rip-roarin'est, snip-snortin'est, flame-breathin'est reptilian ever to stomp the earth. But Rocky is up to the challenge, and his efforts to tame T. Rex take the disagreeing duo on a Western adventure of epic proportion. 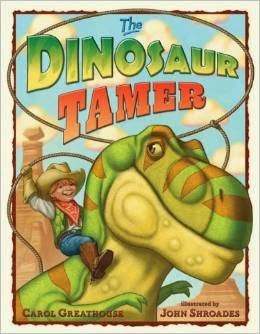 Why I Love This Book: What more perfect combination (especially for boys) is there than dinosaurs and cowboys? And the tall tale aspect of this (with great word pictures and exaggeration - and the cowboy dialect) make it a VERY fun read. Plus the kids will learn about dinosaurs, a bit about the Old West, AND tall tales. And add in a bit of U.S. geography for good measure, and you've got a winner in my book! The illustrations were great too. Just a fun book all around. Susanna Leonard Hill is celebrating the 100th Perfect Picture Book Friday at her blog with a giveaway - so be sure to stop by there and enter - and check out the other perfect picture books in her HUGE collection. This is a different twist on a dinosaur book. Sounds like a fun but educational book! Really like the cover! Loved the cover too - and the illustrations inside are similar. Fun and educational is right. Thanks for stopping by! And you can still find plenty of dino-bones out West! Absolutely true, Julie - and I didn't even think of that until you mentioned it! This is clever and adorable. I'll put it on my list. Thanks! My pleasure - love finding a gem like this! I live in the Land of the Dinosaurs! Lots of dino bones around here. And cowboys! You've found the perfect book! Thanks for sharing! It DOES sound like the perfect book for you! Thanks for stopping by! This cover totally pulls me in! The appeal of cowboys and dinosaurs is undeniable. Absolutely - and it's SUCH a fun read. Thanks for stopping by, Wendy! Unusual combination and a winner for kids. Love the voice. Impressive writing style. Thanks for sharing. You're very welcome - was my pleasure. Thanks for stopping by! sounds perfect - given that some of the first dino bones were discovered by cowboys (or at least ranchers). Wonder what a dino-rodeo would look like? A dino rodeo sounds FABULOUS - don't you think? Thanks for stopping by, Sue!